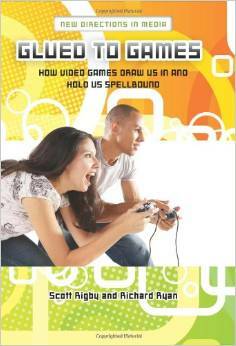 BOOK DESCRIPTION: Glued to Games: How Video Games Draw Us In and Hold Us Spellbound was released in 2011 and brings the first truly balanced review of the psychology of video game motivation and engagement, based on years of research with thousands of gamers. Filled with examples from popular games and the real experiences of gamers themselves, Glued to Games gets to the heart of gaming’s powerful psychological and emotional allure–the benefits as well as the dangers. It gives everyone from researchers to parents to gamers themselves a clearer understanding of the psychology of gaming, while offering prescriptions for healthier, more enjoyable games and gaming experiences.